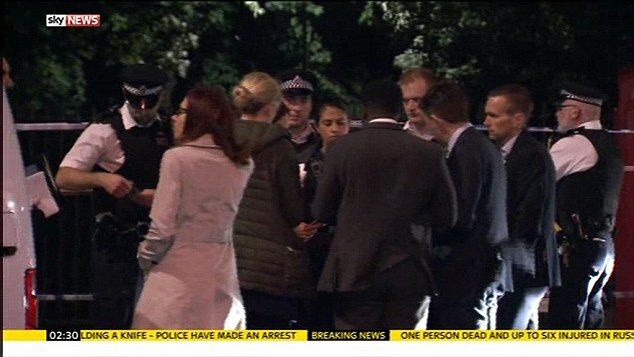 One woman has died and five people have been injured after a suspected terrorist went on a mass stabbing spree in central London. 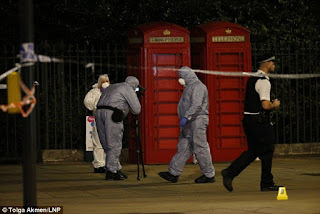 Police confirmed a 19-year-old man with mental health issues was arrested after he was seen 'brandishing a knife' and 'injuring people' in front of horrified onlookers in Russell Square at about 10.30pm last night. He was tasered by police following the incident outside the Imperial Hotel, in Southampton Row. to rule out further suspects. One witness said he saw 'a man flee on a motorbike', while another described hearing one of the victim's 'screaming and covered in blood'. A witness, who gave his name as Michael, said he saw who he believes was the victim bleeding from her back while a friend who had also been stabbed was comforting her. He was yards away from the incident at about 10.30pm on Wednesday and said although his thoughts were with the victim, he felt very lucky not to have been killed. 'They all spoke Spanish so I guess they were a group. I only saw the victim and the girl with the arm stabbed from that group'I just saw blood just next to her. She was lying on the floor with a friend hugging her. 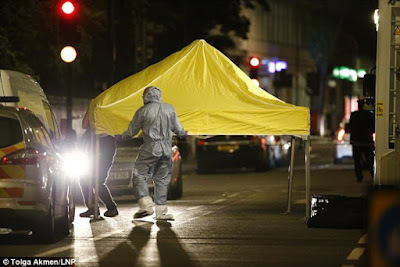 'Michael said the victim, who he believes was the woman who later died, was slumped up against the metal fence opposite the Imperial Hotel in Russell Square. 'The victim was lying on the metal fence. 'A friend was hugging her so she won't fall. Paul Hutchinson, a taxi driver, said he passed the incident shortly after it occurred. 'I drove past Russell Square and the road wasn't shut but the pavement was all taped off by police, lots of armed police, lots of cars and the body was just lying on the floor. You could see the boots sticking out from under the cloth. 'Loads of armed police, cars with lights on and the body on the floor. 'A 35-year-old man, who did not wish to be named, said he saw three men fleeing nearby Queen Square shortly after the incident. Officers arrived at the scene to find six people injured including a 60-year-old woman who died from her injuries a short time later. The condition of the other five is not yet known and police have not yet named or revealed the ages of the victims. 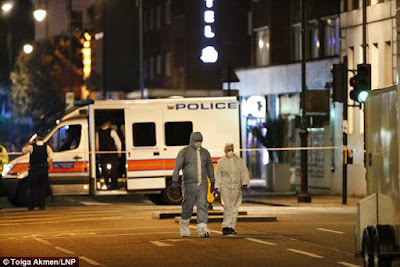 The incident occurred in the same area as where one of the 7/7 bombs detonated in 2005. A total of 26 people were killed when Germaine Lindsay, 19, detonated a suicide bomb on a Piccadilly line Tube as it moved between King's Cross station and Russell Square. And last night's incident comes just hours after the Met unveiled its brand new elite anti-terror unit.